Two U.S. soldiers were killed Saturday when an Afghan army solider opened fire on them in eastern Afghanistan, an Afghan official said. 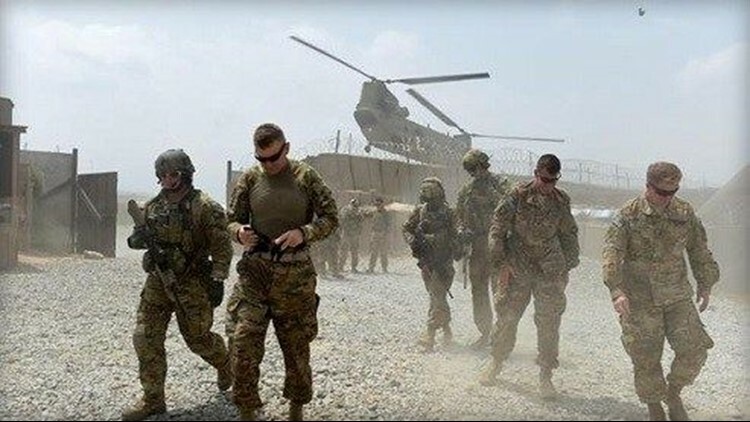 KABUL, Afghanistan (AP) — Three U.S. soldiers were killed and another was wounded Saturday in eastern Afghanistan, the Pentagon said. An Afghan official said the deaths and injury stem from an attack by an Afghan soldier, who also died. In a statement from Washington, the Pentagon didn't provide details about what led to the deaths of the U.S. soldiers. It said the incident was under investigation. A spokesman for the provincial governor in Nangarhar province, Attahullah Khogyani, said in a statement that the attack took place in the Achin district. The Taliban claimed responsibility for the attack. Taliban spokesman Zabihullah Mujahid says in a statement that a Taliban loyalist had infiltrated the Afghan army "just to attack foreign forces." In March, an Afghan soldier was killed after he opened fire on foreign forces at a base in Helmand province, wounding three U.S. soldiers. White House spokesman Raj Shah told reporters traveling with President Donald Trump in New Jersey that Trump was "following the emerging situation in Afghanistan."